NEDHEAD BN7 SYSTEM INCREASES POWER BY OVER 200 REAR WHEEL HORSEPOWER! This Supercar NEDHEAD Phase 4 System produces over 750 Horsepower at the engine and over 200 Rear Wheel Horsepower on a Chassis Dyno Test in the 7 Llitre LS7 engine. The Stock LS7 Z06 Corvette Engine Rated at 505 HP Develops 414 Rear Wheel HP at 6300 RPM. The Supercar NEDHEAD BN7 Phase 4 System Develops 616 Rear Wheel Horsepower at 7200 RPM. 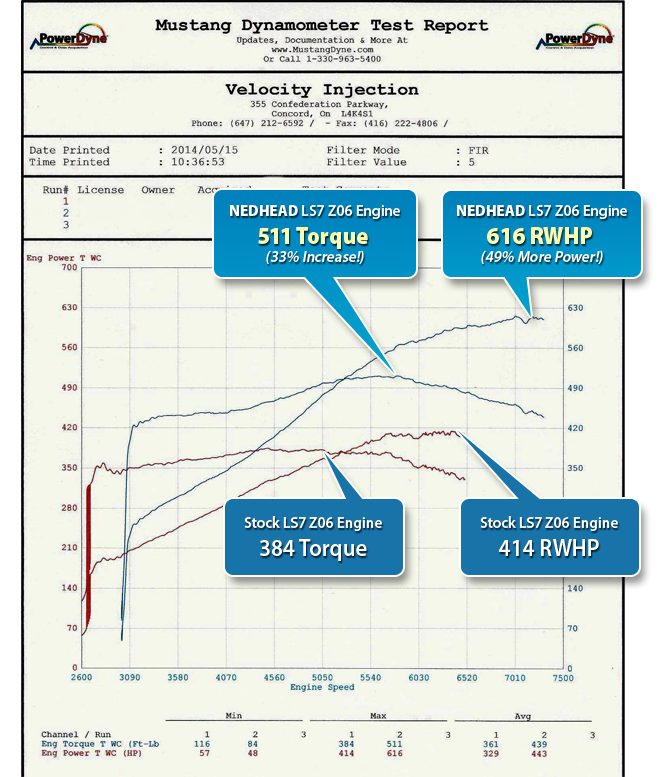 NEDHEAD system increases power by over 200 RWHP and extends the power range by 900 RPM. The following chassis dyno test data demonstrates a 49% increase in Horsepower and 33% increase in Torque for the 7 Litre LS7 Engine in the C6 Z06 Corvette. This Supercar NEDHEAD Phase 4 System on a 7 Litre displacement LS7 engine produces 616 Rear Wheel Horsepower at 7200 RPM in comparison to the stock LS7 Z06 Corvette engine that produces 414 rear wheel horsepower at 6300 RPM. The NEDHEAD Phase 4 System also produces 511 Ft. Lbs. torque at 5800 RPM at the rear wheels in comparison to the 384 FT.LBS torque produced by the stock LS7 engine at 4800 RPM. This Chassis Dyno data demonstrates that the Supercar NEDHEAD Phase 4 System develops a 49% increase in Rear Wheel Horsepower and a 33% increase in Rear Wheel Torque. Total Power under the dyno power curve is also significantly increased as the maximum horsepower range of the LS7 engine increases from 6300 RPM to 7200 RPM which represents a 900 RPM increase (12%) in the maximum power range for the LS7 engine. This demonstrates that maximum horsepower under the dyno curve is increased by a range of 900 RPM and 200 Rear Wheel Horsepower. 49% Increase in Maximum Rear Wheel Horsepower from 414 to 616. 33% Increase in Maximum Rear Wheel Torque from 384 to 511. 12% Increase in Maximum Horsepower Range from 6300 RPM to 7200 RPM. To determine the maximum power at the LS7 engine for the Supercar NEDHEAD BN7 Phase 4 System it is important to understand that maximum power is developed at 7200 RPM and this 900 RPM (12%) higher engine and drive-rain operating range from 6300 RPM to 7200 RPM significantly increases parasitic drive-train loss to a conservately estimated amount of over 20%. The Supercar NEDHEAD BN7 Phase 4 System increases the naturally aspirated LS7 engine power by 200 plus rear wheel power and extends the maximum horsepower range of the LS7 engine to over 7000 RPM which represents a total power increase that is greater than what most street legal Corvettes produce with supercharged and turbo charged LS engines. As demonstrated in our performance video section a Z06 Corvette with a naturally aspirated NEDHEAD LS7 engine system can run over 138 MPH in the quarter mile which is much faster than a Supercharged ZR1 C6 Corvette. The NEDHEAD BN7 Phase 4 System delivers great power and superior LS7 engine performance, naturally aspirated, with no power adders.